I don't know why, but I feel like my Uncle has died. I never met Robin Williams, nor had a conversation with him, but last night when I checked my Facebook page and saw the news about his death I was overcome with a profound sadness. 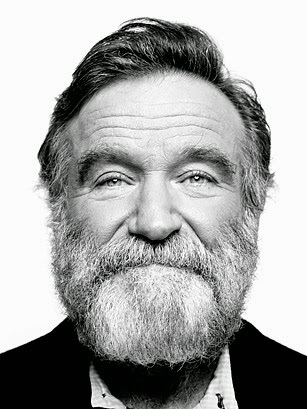 I think I was vaguely aware that he suffered from depression, but was not familiar with the extent of it. I also don't pretend to understand what he struggled with or profess to know what would have helped, but I so wish I could have grabbed him an hour before it happened and put life in fast-forward so he could have seen the outpouring of love and admiration people held for him. As people we tend to only appreciate things once we've lost them. That might be the biggest tragedy of all in this story. Although he won many awards and received much praise, the genius of comedy is often overlooked and diminished as "easier that drama". Oh, if people only understood how dynamic, subtle and difficult making people laugh really is. I remember watching Mork and Mindy as a child, laughing. I remember watching Dead Poet's Society and crying. I remember watching Good Morning Vietnam and feeling indignant. I remember watching Good Will Hunting and understanding for the first time how a man could simultaneously love a woman and know that she farted in her sleep. When I think of him now I will always see a clown sitting in front of a mirror after a show, his bright costume rumpled and his makeup crumbling. A tear running down his cheek and exhausted, he will get up the next day and do the same show all over again. If only the joy and laughter on the faces of the people he entertained had been enough? But that's not the way our bodies and minds work. If there is no peace inside, no outside force can cajole it into being. I hope he has found the peace he deserves.